JW Shinyak, a subsidiary of JW Holdings, said Tuesday that it has signed a memorandum of understanding with Aekyung Industry Corp. to cooperate on developing derma cosmetics products. 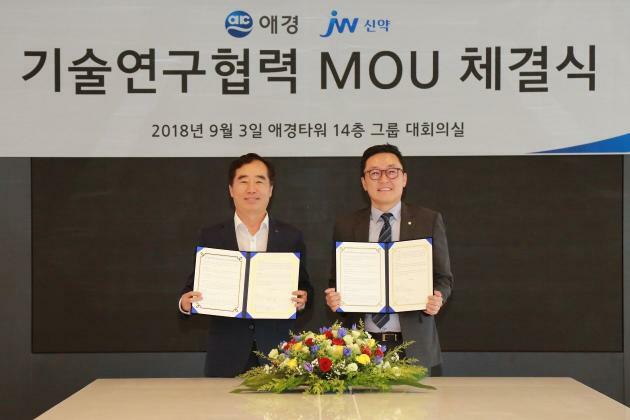 JW Shinyak CEO Baek Seung-ho (left) and Aekyung Industry Corp. CEO Lee Yeun-kyu hold up the MoU agreement at Aekyung headquarters in Donggyo-dong, Seoul, Monday. Under the accord, JW will supply the primary raw material, cytoplasmic transduction peptide epidermal growth factor (CTP-EGF), to Aekyung, which will use the substance to develop and sell new products that can help improve skin elasticity. CTP technology, developed and patented by JW CreaGene, a subsidiary of the JW Shinyak, is a drug delivery technology that enables cell membrane to open up cellular pathways and effectively deliver medicines into cells. Its cell permeability is five times higher than the conventional protein transduction domain (PTD) technology and helps drugs to become more effective even in small doses.